Dance With Me Baby #Giveaway (2011 Holiday Gift Guide) CLOSED! Do you remember those adorable dancing babies that everyone was talking about from Ally McBeal? I always thought that they were so cute and it would be even better if there could be a doll like those dancing babies for kids. Now I know it has been quite a few years since the dancing babies and I know that my daughter and other little girls probably have no idea what we would be talking about if we were to mention those dancing babies. Well honestly I had almost completely forgotten about those adorable babies until I first saw a Dance With Me Baby from Baby Born. My daughter had seen a commercial for the Dance With Me Baby Dolls, and said that I just had to see it. She was going on and on about how cute it was and how she would love it if Santa could bring her one of the Dance With Me Baby Dolls this year for Christmas. So I went online and looked up the doll then watched the commercial online. And when I was watching the commercial all I could think about was those dancing babies. Very cute!! Well I was given the chance to review one of these adorable dolls for myself, which I will eventually give to my daughter for Christmas this year! Now I was thinking that this doll probably has its own songs and those will be all it will dance to. But I learned that this doll is way more advanced than I had imagined. She does come with her own special song that she dances to, but you can also hook up a MP3 player and the doll will dance to the beat of any music you put on. The first thing that popped into my mind and I told my husband was, “Why didnt they have these dolls around when I was little? ?” I mean, sure there was that really cute dancing flower that would dance to music that you would play through a boombox, but this is a dancing baby doll!!! I would have so loved one of these dolls when I was little. 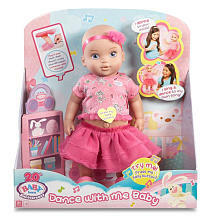 I did hook it up to my MP3 player and it was very entertaining to watch this adorable baby doll dance to my music. It was quite entertaining to watch it dance to some of my so called “Old School” music that I have on my MP3. I can so see why my daughter wants this doll, and this Christmas when she gets up to see what Santa has brought her, she will find her Baby Born Dance With Me Baby Doll under the tree!! This year, since we are already getting into the holiday spirit over here at Mommy Katie, the wonderful people from Baby Born would like to join in the gift giving spirit by giving one of my amazing readers their own Baby Born Dance With Me Baby Doll!! Tell me what song you would like to see this doll dance to? Please leave me your email with this entry!! This giveaway is open to US residents. This giveaway will end at 11:59 pm on November 30,2011. Winner will be chosen at random.org and will be given 48 hours before another winner will be chosen. All products for reviews and giveaways are given as a sample from the companies. All opinions in reviews I conduct are my own. I was not paid to say anything or review any products. Next Post Cars2 Comes Out November 1st!! I'd like her to dance to Ants In Your Pants by Eric Herman. Dance with my baby gives an amazing feeling to me and she does love my company in dance as well.